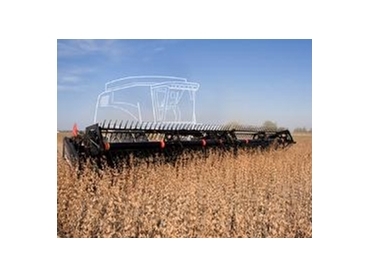 Available from MacDon Australia , FD70 Flex Draper headers will boost combine harvester productivity in high volume, high bushel crops as well as low-podding crops such as beans, soybeans, peas and lentils. FD70 Flex Draper headers combine the latest draper technology with a unique three-section flex frame. This allows each section to independently follow ground contours in a balanced floating action while at the same time providing a better flex range. FD70 Flex Draper headers feature adapters that are available for most current model combine harvesters, a model PR15 pick-up reel (5 bat) and auto-header-height with header angle and ground pressure indicators. Hydraulic header tilt and fore-aft reel positioners, adjustable skid shoes, cutterbar poly wear plates and long life V-guide rubber skim-coated drapers are also features of FD70 Flex Draper headers. FD70 Flex Draper headers from MacDon are available in sizes 30’ (9.1m), 35’ (10.7m) and 40’ (12.2m).